It is important that BYU-Idaho campus community follow the university policy for use of copyrighted material on campus. It can be challenging to ensure that faculty, students and other staff members have the rights they need to use and share the content they need without wondering if it's legal. 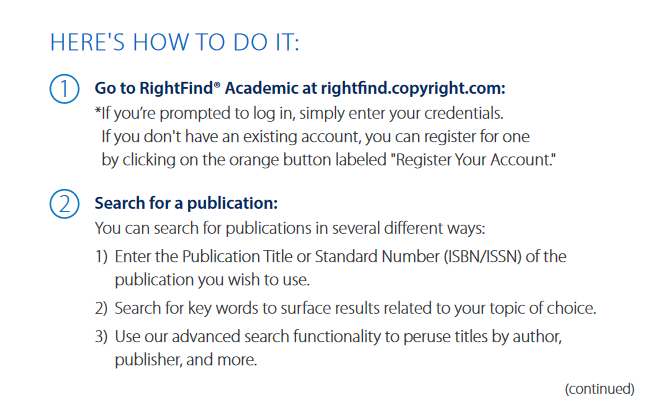 To facilitate this process, the university has adopted the Academic Annual Copyright License (ACL) from the Copyright Clearance Center (CCC) to provide content users campus-wide with the copyright permissions they need in a single, multi-use license.This license provides faculty, librarians, students, and administrative staff with comprehensive, institution-wide coverage for the reuse of text-based content in both print and electronic formats for educational and research purposes. There are over a million titles included in the license repertory, and this list continues to grow with as many as 25,000 titles per month. 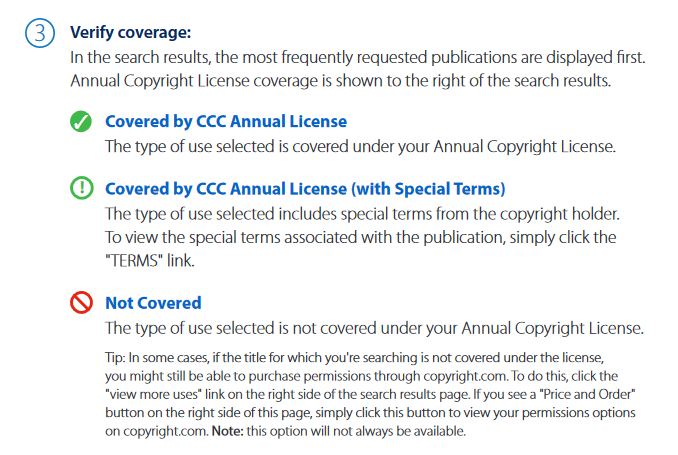 Copyrighted material covered by the CCC Annual Copyright License, but subject to individual publisher restrictions as noted in the license. The Annual Copyright License greatly reduces the time spent securing copyright permissions. With the searchable online catalog, users can verify coverage in seconds. So instead of ordering individual permissions and managing invoices, staff members can use and share content with confidence and dedicate more time to higher value activities. Uniform set of pre-approved usage rights for paper and electronic coursepacks, course management system postings, classroom handouts, electronic library reserves, research collaboration, and administrative and faculty communication. Broadened awareness of intellectual property on campus. The license also demonstrates a good faith effort by the university in being compliant with copyright laws.